A hearing impairment is a hearing loss, (STET)whether permanent or not, that affects a child’s educational performance. This definition includes children who have the capacity to receive some auditory stimuli, including speech and language; this capacity is known as residual hearing, which can be supported by the use of a hearing aid. information through hearing, with or without amplification. A student with this condition cannot receive sound in all or most of its forms. 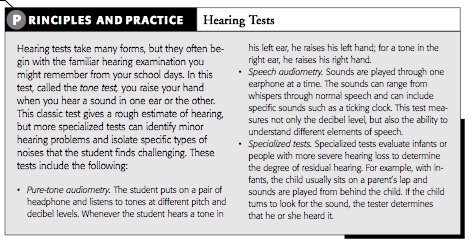 In other words, the student with a hearing impairment or hearing disability can respond to certain auditory stimuli, whereas the student who is deaf cannot process any information through hearing. Students anywhere along the hearing continuum will, of course, require appropriate accommodations. During the 1998–1999 school year, about 1.3 percent of the students who received special education services (and 0.1 percent of the overall school-age population) were classified as either hearing impaired or deaf (U.S. Department of Education, 2000). A hearing disability can occur in one or both areas and may affect one or both ears (NICHCY, 2001a). 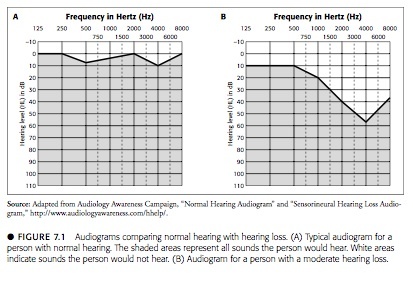 Figure 7.1 shows two audiograms (graphs of hearing ability) that compare a person who has normal hearing to a person with a typical hearing loss. The individual represented in audiogram B cannot hear high-frequency sounds without a hearing aid. This person has difficulty understanding what others say, because much speech information, particularly for consonants, is inaccessible. A child who cannot hear sounds at less than 90 decibels is considered deaf for the purposes of educational placement. Conductive hearing loss is caused by disease or obstruction in the outer or middle ear. An individual with this condition can usually use a hearing aid. Sensorineural hearing loss is the result of damage to the delicate sensory hair cells of the inner ear. Mixed hearing loss combines both conductive and sensorineural losses, meaning that a problem exists in the outer or middle ear as well as in the inner ear. Central hearing loss results from damage to the central nervous system, either in the nerves that occupy the pathways to the brain or in the brain itself. In planning instruction for a student with a hearing disability, you may benefit from knowing which type of loss is involved, so that you can determine what technological aids are in place and which might further your student’s educational goals. Technologies have developed to assist individuals with specific types of structural damage to the ear. For example, some types of hearing aids can help students with conductive hearing loss. Cochlear implants can assist persons with sensorineural damage. Hearing loss can be either prelinguistic—that is, it precedes a child’s language development—or postlinguistic, occurring after a child has acquired some degree of speech and language skill. Hearing disabilities can also be described as congenital or adventitious. Congenital means that the hearing loss is genetic or occurred at birth, and adventitious means that it occurred because of an accident or illness after birth. Students who have lost their hearing postlinguistically or adventitiously may continue to use speech as a method of communication. Or they may use speech together with sign language or speech reading (lip reading). Students who lose their hearing before developing speech may not use speech at all, communicating solely with sign language. However, as with all other types of disability, no two students are alike. Trying to fit a student into a preconceived category will likely lead to embarrassment or frustration for you, the student, and the parents. The long-term educational effects of a hearing loss can depend to a great extent on the age at which the loss occurred. Children with hearing and those with hearing losses (of normal or above average intelligence) follow the same pattern of cognitive development, including initial phases of language development such as babbling and the production of other sounds. Further development may, however, proceed at a different rate in children with hearing loss. Between the ages of one and three, the average child’s vocabulary jumps from 200 words to 900 words. This is when both hearing and nonhearing children make the greatest gains in language acquisition. A child who has not begun to build a vocabulary or to figure out the rules of grammar by age three can find these tasks extremely difficulty later on. That is why early intervention programs for students with hearing disabilities are extremely important. 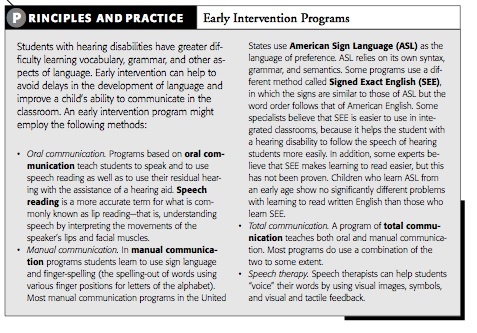 (See Principles & Practice: Early Intervention Programs.) It is critical, according to some experts (Solit, Taylor, & Bednarczyk, 1992), for children to experience rich language environments whether they can hear or not. Educator who must decide whether to include a child with a hearing problem in the regular classroom follow the same general process as they do when evaluating inclusion for other exceptionalities. In order to provide the best learning environment for a child, teachers, parents, and related services specialists review the child’s particular needs before making any placement decision. In the case of a child with a hearing problem, communication issues are the first addressed. A student who has learned speech reading and sign language in an early intervention program and is comfortable around hearing persons might be best placed in a regular classroom where he can focus on age-appropriate academic material. A student who is not comfortable with speech reading and lacks good communication skills might learn best in a self-contained classroom. Although some students with hearing disabilities find inclusion easy, others struggle with loneliness in inclusive classrooms. They have difficulty communicating with peers and with hearing teachers and parents; often they feel “different.” As a teacher, be prepared to help the hearing-disabled student in your classroom who does experience feelings of isolation. Many students succeed in the regular classroom once they have mastered communication techniques. However, some parents of children with hearing disabilities prefer that their child be placed with children who have similar issues and experiences. Many in the deaf community assert that deaf people have their own culture, with distinct folkways and a separate language (American Sign Language). These convictions should not be ignored (not the least of why is that it would be a form of audism). As is the case with all the laws relating to students with exceptionalities, parents have the final say in where their child will be placed. Some children with hearing disabilities may attend a residential program. For example, the Arizona State School for the Deaf and Blind in Tucson offers both day school and residential programs. Because Arizona is a fairly large state with many rural areas, a residential program—rather than a long daily commute—might be the most logical choice for a child who is learning sign language or mobility skills. In fact, many families of children who are deaf or hard of hearing want their children to have a school experience with other students like them, rather than be included in a regular school where they might be the lone student with hearing disabilities. In addition to school-year programs, students with hearing disabilities may participate in summer-school programs. The Texas School for the Deaf has summer sports camps, driver-education programs, communication skills workshops, and high school retreats. The teacher should refrain from speaking with his or her back to the students. This is of particular importance when a child is using speech reading. The student with a hearing disability should be able to see the teacher and peers from his or her vantage point in the classroom. During discussions, too, the student should be able to see the faces of all the other students (a circle can work nicely). If a sign-language interpreter is present, the lesson pace should allow the interpreter enough time to convey the information before the instructor moves on to the next point. The student should receive visual aids to reinforce the instructor’s verbal delivery of lessons. Copies of overhead transparency lecture notes, writing on the board, and written handouts of instructions can all reinforce learning. As a side note, giving all your students copies of a presentation outline can be helpful, especially for any student who has trouble taking notes or focusing on the important elements of a lecture or presentation. How children perceive and act towards other children is very important to young ones. Whether they are accepted by their friends or society is what gives a child good self-esteem. Most kids with hearing disabilities feel as though they are different and people perceive them differently and don't give them a fair chance. How can children learn and want to be in a classroom when they feel that the other kids don't like them because they are deaf or wear hearing aids. This article discusses the attitudes of the hearing impaired children. 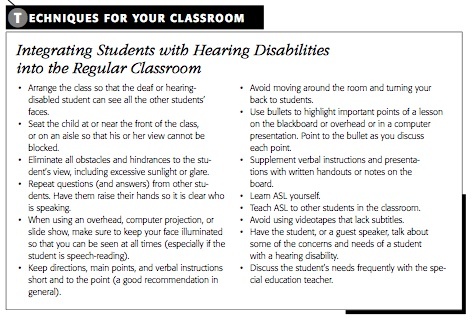 Successful classroom discussions and socialization rely on helping your hearing students to understand how to communicate effectively and respectfully with a student who has a hearing disability. Be sensitive in planning discreet opportunities to convey this information to keep the student with special needs from feeling separated from the rest of the class. A few modifications to your basic classroom procedures can give the student with a hearing impairment an opportunity to be included more fully with his or her peers. To make communication easier for the student with a hearing impairment, have students arranged in a circle or semicircle and remind them to speak one at a time. A simple strategy is to point to the person who will speak next and wait for the hearing-disabled student to locate the speaker. You might also pair each student with a partner or study buddy. Each person can count on her partner’s help to fill any gaps in class notes, clarify directions or assignments, or assist with class work. The buddy would not be responsible for taking care of the student with a hearing disability, but could provide support and act as a special contact in the classroom. Using a buddy system can also give the student with hearing loss an opportunity to share responsibilities and to feel that he or she can contribute to the learning of another. As mentioned earlier, loneliness or lack of social interaction with the hearing world may be the most significant challenge a hearing-disabled student faces. As a teacher, you should make every effort to plan classroom activities that include the student to the greatest extent possible. For the most part, this student should be treated no differently than others; focus on the student’s challenges only when hearing is an integral part of your lesson. In those instances, your role is to provide assistance, restructuring, or other interventions necessary to help the student participate in the learning activity. To learn about deaf persons learning through Deaf Theater, click here. Your school may have a sign-language interpreter available to assist students with hearing disabilities. Some schools and school districts assign an interpreter to each student with a hearing disability. Others place several students with hearing difficulties in a classroom where the interpreter is working. A sign-language interpreter translates the spoken communication of the classroom into signs for the hearing-disabled student, and also voices (speaks aloud) the signs that the student is making. The interpreter’s job is to facilitate communication between the student with hearing problems and you and the other students, not to teach. Do not expect the interpreter to act as a teacher’s assistant or classroom aide. 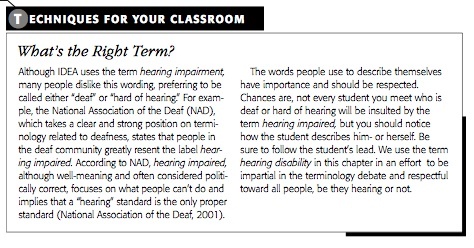 Don’t be afraid of using words like say or hear when addressing a student with a hearing disability. These words are regular parts of our vocabulary, and the student knows what you mean. Close communication with the school speech-language specialist can also furnish you with practical suggestions for modifications in the curriculum or its presentation. The speech-language specialist may also work individually with a particular student and have tips to share about past successes with that student. 1. Note: The basis of the text for the exceptionalities section is taken from Integrating Technology for Meaningful Learning, published by Houghton Mifflin in 2003. I am the author of that book and claim the intellectual content of the book in this wikicourse for instructional purposes. Plagiarism will not be tolerated in this course.